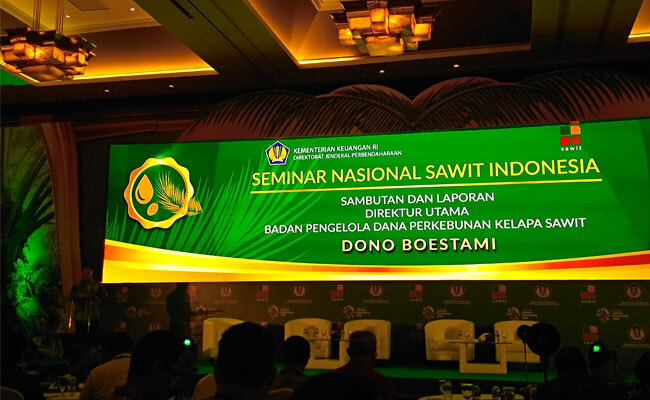 InfoSAWIT, JAKARTA –Palm oil Plantation Fund Management Agency (PFMA) supports to expand the B20 Mandatory Program which the government has planned to support the utilization of renewable energy, and also to save the foreign exchange reserves. One of the supports is by preparing the incentive fund which is needed to produce biodiesel. “We have prepared the fund to expand the biodiesel mandatory program (B20) and it is hoped that the program could absorb the over supply of palm oil products in the markets,” Director of PFMA, Dono Boestami said when opening The Seminar “Menguatkan Pondasi Kelembagaan BPDP – KS untuk Mendukung Sawit Indonesia yang Berkelanjutan, Mengurangi Angka Kemiskinan, dan Mewujudkan Kesejahteraan” in Hotel Borobudur, Jakarta, Monday (20/8/2018) where InfoSAWIT also attended. Years before, the government agreed to implement and run the program to expand diesel fuel to be mixed 20 percent with palm oil biodiesel (B20) both for Public Service Obligation (PSO) and non-PSO. In addition the B20 program is one effort to save the exchange of the country. “To advantage biodiesel, in 2017 PFMA gave incentive to distribute 2,3 million kiloliters of biodiesel. Until the first semester in 2018, PFMA also gave incentive to distribute 1,1 million kiloliters of biodiesel,” Dono said. He thought, at least, there are two advantages got from biodiesel mandatory program. The first is to support the new and renewable energy policy by energy mixture in this country to realize the energy security nationally. The second is to support the realization of crude palm oil (CPO) stable price by influencing the offer and demand of palm oil and its derivative products. Biodiesel Mandatary Program is hoped to be the solution to solve the abundant stock because of the decreasing CPO exports and the market high tension globally. In May 2018, the CPO production reached 4,24 million tons or increased 14% compared to April which reached 3,72 million tons.